The deepsea redfish is in many regards similar to the golden redfish. It just lives deeper. The fishing areas around Iceland and global distribution are very comparable (except for the depth of course). Size in catches is similar, but the deepsea redfish matures larger, or at the size of 37 to 42 cm long. It is very difficult to age determine the deepsea redfish. Spawning time is similar as with golden redfish but the deepsea redfish has more larvae, or from 40,000 to 400,000. The main food is also zooplankton, mostly krill. It is benthopelagic as the golden redfish but differs as there seem to be two stock components; one is along the continental shelf break but the other below 500 m depth in the open ocean, living apparently a pure pelagic lifestyle. The Norway redfish is much smaller than its cousin deepwater redfish and is only about 18-30 cm in length. The Norway redfish is red-yellow-grey on the back and sites and almost white on the stomach. Its haibtats is in the North Atlantic. Northern shrimp is a sub-arctic species, widespread in the northern parts of the North Atlantic and the North Pacific Oceans. In Icelandic waters it is found from the southwest coast of Iceland and along the west, north and east coasts, most often at depths of 50-700 m. It is most common in offshore waters below 300 m depth. High concentrations can also occur at much shallower depth in bays and fjords off the north coast. They start out male, but after a year or two, their testicles turn to ovaries and they complete their lives as females. The spotted catfish is very similar to its more common cousin the Atlantic catfish, except it has a spotted coloration similar as leopards. It can get quite large or up to 144 cm long. Unconfirmed sources indicate a maximum size of 180 cm. It can be found all around Iceland, but is much more common in the colder waters in the north and east. 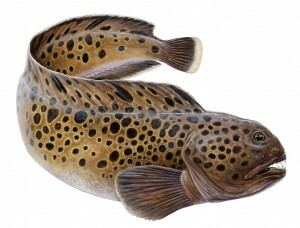 It chooses deeper waters than the Atlantic catfish, or a depth of between 100 and 700 m, mostly on mud or sand bottom. It is found in European waters from Spitsbergen in the north to the northern North Sea in the south. It is also around the Faroe Islands, in southern Greenlandic waters and from Labrador to Cape Cod in North America. Dab is small compared to other flatfishes of commercial importance in Icelandic waters, usually between 20 and 35 cm in total length. The largest individual found in Icelandic waters was 48 cm, which is a world record. Growth is fast during the first years but slows after reaching sexual maturity at the age of 2 to 3 years for males and 3 to 4 years for females. Females grow faster and reach an greater age than males or up to 14 years. Dab probably spawns all around Iceland, earliest spawning starting from the middle of April off the southeast coast then spreading clockwise around the country. The last spawners are along the east coast where spawning probably starts around the middle of June. The diet of the dab is variable, it is an opportunistic feeder and can handle large food items. Various benthic invertebrates are common in the diet, as are sandeels and capelin. Discarded intestines from fishing boats are commonly found in dab stomachs. The tusk is a medium to large sized codfish, usually between 40 to 90 cm long, but the largest individual caught in Icelandic waters measured 120 cm. It is found all around Iceland, but is much rarer in the colder waters north and east of the country. Mostly it occurs on hard bottoms at depths between 20 to 1,000 m, older fish usually in the deeper waters. It is found in European waters from Murmansk in the north to Ireland in the south. It also occurs around the Faroe Islands, in southern Greenlandic waters and from Newfoundland to Cape Cod in North America. The saithe is a large codfish, usually between 70 and 110 cm long in catches, but the largest individual caught in Icelandic waters measured 132 cm. It is found all around Iceland, but is rarer in the colder waters to the north and east of the country. The saithe can be described as benthopelagic fish, i.e., it occurs both close to the bottom and in the water column. It has a streamlined shape and is consequently a very good swimmer. It can swim rapidly all over the Icelandic continental shelf and individuals tagged in Icelandic waters have several times been fished along mainland Europe. Fishes tagged in Europe have also been fished in Icelandic waters. The saithe is native to European waters from Murmansk in the north to the English Channel in the south. It is also found around the Faroe Islands, in Greenlandic waters and from Labrador to Cape Cod in North America. The haddock is a rather large codfish, usual size in catches is between 50 and 65 cm long, but the largest individual caught in Icelandic waters measured 112 cm. It is found in abundance all around Iceland. During cold periods it is rather rare in the colder waters off the north coast, but in warmer periods it can be more common in the north than in the south. Mostly it occurs over soft bottoms at depths between 10 and 200 m. It is found in European waters from Spitsbergen and the White Sea in the north to the Bay of Biscay in the south. It also occurs around the Faroe Islands, in southern Greenlandic waters and from Labrador to Cape Cod in North America. The Greenland halibut is currently the most valuable flatfish species in Icelandic waters, but it is a deep-water species, mainly found in the cold waters to the west, north and east of Iceland, a very different distribution from the other flatfish species. The Greenland halibut can be found in cold waters all around the Arctic, both on the Atlantic as well as on the Pacific side. Greenland halibut in East Greenlandic, Icelandic and Faroese waters are considered to be the same stock. The Ling can reach a very large size, the largest on records was 212 cm long. It occurs all around the country but is very rare in the colder waters north and east of Iceland. It is found over a wide depth range, spanning from 15 to 1000 m depth. Usually the younger fish are in shallower waters. It is found in European waters from northern Norway to the Mediterranean Sea. It also occurs around the Faroe Islands, and has been reported off southern Greenlandic waters and on the Grand Banks off Canada. The blue ling is a medium to large sized, very long and slender codfish. Usual size in catches is 70 to 110 cm, but the largest individual caught in Icelandic waters measured 153 cm. It is found all around Iceland, but is much rarer in the colder waters north and east of the country. It is primarily a deep water fish, found in the depth range of 130 to 1500 m but mostly at a depth of between 300 and 800 m. It is found in European waters from Murmansk and into the Mediterranean Sea. It also occurs around the Faroe Islands, and has been reported in waters off southern Greenland and on the Grand Banks, off Canada. Plaice is a medium sized flatfish. It has a smooth skin as opposed to, for example, dab and long rough dab. It is easily recognized by the red or orange spots on the otherwise dark back, the underside is white. The maximum recorded size in Icelandic waters is 85 cm, but the usual size in catches is from 30 to 50 cm. Plaice is common all around Iceland from the seashore to 200 m depth, on sandy or muddy bottoms. It can also tolerate fresh waters for some time. In European waters it is found from the White Sea and the Barents Sea in the north down to the western part of the Mediterranean Sea in the south. It is not found in North American waters. Previously, flatfishes were considered rather sedentary. Tagging studies on the plaice have, however, shown that this does not hold entirely true. The plaice undertakes large scale feeding and spawning migrations in the waters around Iceland, fishes tagged on one side of the country have even found at the other side. The catfish is a large sized, rather long fish, usually around 50 to 60 cm long, but the largest individual caught in Icelandic waters measured at 125 cm. It is found all around Iceland, but is most common off Vestfirdir (West Fjords) peninsula in the west. It mostly occurs on mud or sand bottoms at depths between 40 to 200 m. It is found in European waters from Murmansk in the north to the English Channel in the south. It is also around the Faroe Islands, in southern Greenlandic waters and from Labrador to Cape Cod in North America. Cod is “the fish” in Iceland. 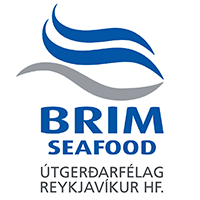 It is by far the most important marine resource in Icelandic waters. Its economic importance has only briefly been surpassed by herring in the 20th century and possibly Greenland shark in the 19th. 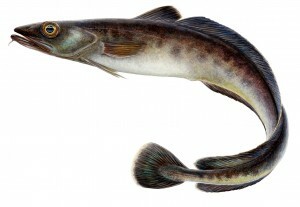 The cod is also a large, fecund, greedy and rather fast growing fish and therefore has great impact on other marine species in Icelandic waters. The history of fisheries around Iceland has more or less rotated around the cod. Measures to manage the fisheries by extending the EEZ, closing areas to fishing and controlling the fleet size and the amount fished, have all been primarily aimed at the cod but only later also been applied to other species. The evolution of the fish processing industry has also primarily been because of the cod. The cod fisheries have, therefore, shaped Icelandic society for centuries. The only species that approaches the cod in historical importance has been the herring, but then only during the late 19th and early to mid 20th century. close relative, the Pacific herring (Clupea pallasi) is also found in the northern Pacific Ocean. It is a pelagic zooplankton feeder, mostly feeding on the copepods Calanus finmarchicus. It is commonly between 30 and 40 cm length; the largest herring measured in Icelandic waters was 46.5 cm. It is a multispawner as opposed to the capelin and generally spawns in shallow waters in spring or summer. It can reach up to 25 years of age. The mackerel is a streamlined and fast swimming fish known from extensive migrations. It grows rapidly and is usually around 15 cm in the first autumn after spawning (in spring). It reaches sexual maturity at the age of 2 to 3, then around 30 cm long. Common size for adults is from 35 cm to 45 cm, but it can reach 60 cm in length. The mackerel feeds on a variety of pelagic animals, mostly crustaceans and fish juveniles. The great silver smelt is somewhat herring-like in appearance. It is a streamlined fish with silvery coloration and large scales. It has huge eyes, covering almost half the head. Common size in landings is from 40 to 50 cm, but the largest individual measured in Icelandic waters was 70 cm. It can reach more than 20 years of age. The great silver smelt is a bento-pelagic fish, i.e. it occurs both close to the bottom (where it is fished with bottom trawl) and in the water column. The blue whiting is a rather small codfish, usually 22 to 30 cm long, but can reach up to 50 cm in length. It is unique among codfishes since it is purely an open ocean pelagic fish. It can be found all around Iceland but occurs only sporadically off the north and northwest coast. It occurs in European waters from Murmansk in the north to the Mediterranean Sea in the south but also around the Faroe Islands, in Greenlandic waters and, in small amounts, off North America. A related species, Micromesistius australis, lives in the Southern hemisphere. The capelin is possibly the most ecologically important fish in Icelandic waters. It is a small pelagic fish, usually between 15 and 18 cm in catches and has a very short life cycle. It spawns in late winter along the south and southwest coast of Iceland at ocean temperatures of 4°-7°C. The eggs and larvae drift north to the continental shelf of North Iceland or Greenland. It gradually migrates further north as it grows and spends the time before maturity feeding in the Iceland Sea on zooplankton, mainly copepods. Maturity is usually reached at the age of 3, but some become mature one year earlier or later. At this time they condense into large schools and migrate around Iceland, usually clockwise to the spawning grounds in the south. During these migrations the capelin becomes the main food of many species in Icelandic waters, most importantly the cod. Spawning takes place in very shallow waters and is a very intense behavior. After spawning all the males and most of the females die. The lemon sole is a medium sized rather thickset flatfish, usually around 30 cm long, but the largest individual caught in Icelandic waters measured at 63 cm. It is found all around Iceland, but is much rarer in the colder waters north and east of the country. Mostly it occurs on rocky or sandy bottoms at depths between 50 to 350 m. It is found in European waters from Murmansk in the north to the Bay of Biscay in the south. Also around the Faroe Islands, in Greenlandic waters and from Labrador to Cape cod in North America.